The PVG Scheme is managed and delivered by Disclosure Scotland which, as an executive agency of the Scottish Government, has taken on additional responsibilities. These include taking decisions, on behalf of Scottish Ministers, about who should be barred from working with vulnerable groups. Helps to ensure that those who have regular contact with children and protected adults, through paid and unpaid work, do not have a known history of harmful behaviour. Is quicker and easier to use, reducing the need for PVG scheme members to complete the full detailed application form every time a disclosure check is required. Strikes a balance between proportionate protection and robust regulation and make it easier for employers to determine who they should check to protect their client group. Do you need a PVG check? 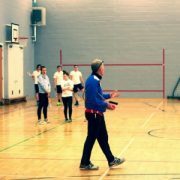 A check is mandatory for all coaches taking a (UKCC) Level 1, 2 or 3 courses. We also recommend that anyone involved in regularly caring for, training, supervising or being in sole charge of children or vulnerable adults gets a check. If you are a member of a Scottish Squash affiliated club, we will pay for the cost of the PVG check and help you with the application. We can process individual PVG checks or visit you at your club to process multiple checks.